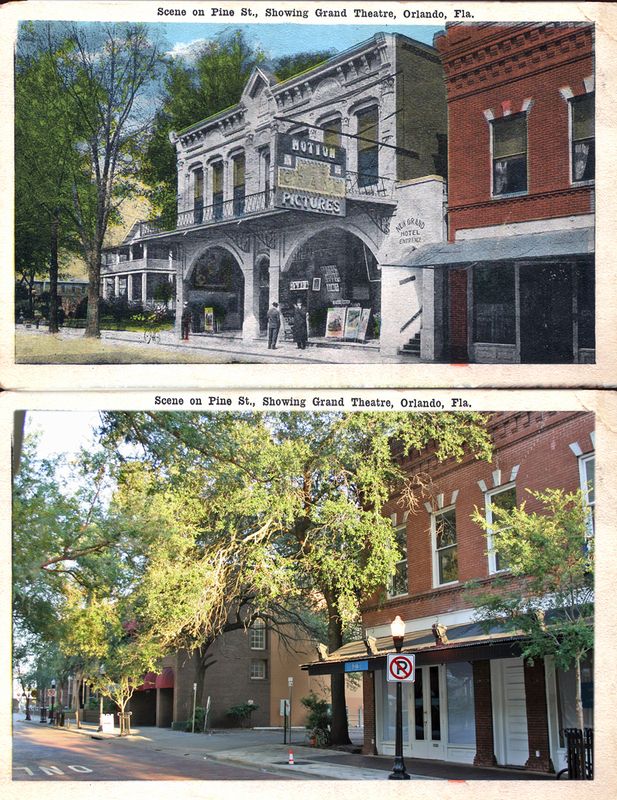 Orlando residents have enjoyed attending live performances and movies in the comfort of a theater since 1884. The first major theatre was an opera house downtown. It was housed in a large wooden frame building with a stage lit by kerosene lamps (This was roughly where the Solaire high-rise apartment building is today). The Grand Theatre came along in 1912. By this time, Orlando had other theaters, but the growing popularity of motion pictures seemed like a good opportunity for Orlando businessman, Colonel T.J. Watkins. He began constructing the Grand Theatre and Grand Hotel at the Nashville Block located between Central and Pine. 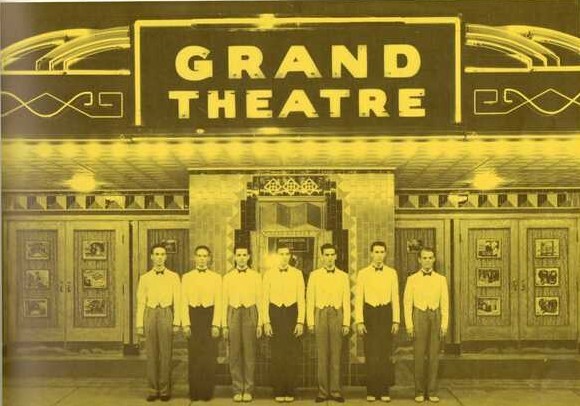 The Grand Theatre opened as a silent movie house, when motion pictures were a draw even without sound. The film projectors were hand-cranked. Musicians played music live for the films. Popular musicians were even billed along with the movie. A few years after opening, the theatre was one of the first locally to use a photoplayer, which was a sort of automated orchestra for silent films. In 1915, the theatre introduced a new policy that included partitioning half of the balcony for use by African-American film goers. Today Orlando is better known for movie studios than movies filmed here. Although Universal Studios and Disney’s Hollywood Studios are mostly theme parks, some movies have been filmed here. The list includes Parenthood (1989), The Waterboy (1998), and admit it or not Larry the Cable Guy: Health Inspector (2006). When did we get our start in the movie business? 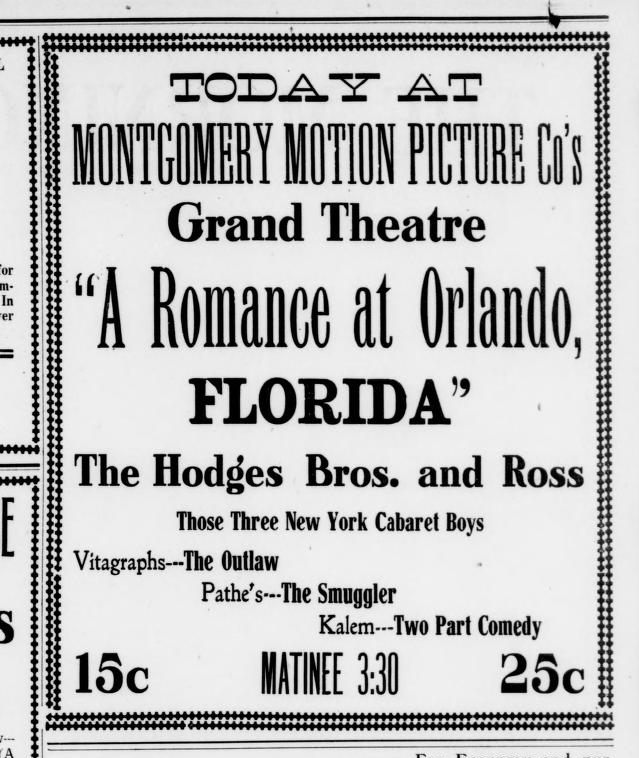 In 1914 with the silent film Romance in Orlando. Silent films gave way to movies with sound. Gone With The Wind was such a hit after its 1939 release that The Grand was sold out for two months straight. In the decade to follow the building began to age and was in need of updating in order to stay relevant. In 1954, the theatre was completely redecorated, refurbished, and rebranded as the Astor Theatre. Newer technology — including a sound system and air conditioning — were added. Two rows of seats were removed from the back to make room for concessions and the women’s room was outfitted with a powder bar. Now, the ladies could freshen up during intermission. The new name and remodel were not enough to save the Grand. The screen went dark in the early sixties and the theatre was torn down about 1965. In the post card scene above, the brick building seen to the right of the theatre still stands (where Backbooth bar is currently located). Nothing is really left of the Grand Theatre today, but memories of the silver screens golden age. I really enjoy your blog and thank you for taking the time to keep it updated. Just want to point out a small correction to the above story–I believe the correct name of the fellow who founded the Beacham Theater is Braxton Beacham. Thanks for all you do and keep up the good work! Thank you! You are correct! I will edit it. Thanks for letting me know. Is there any chance you could do a page on the Roxy Theatre, 220 W. Church St.? Hardly any information seems to be out there regarding this large movie theatre. Backbooth was in the building on the left, to the left of the parking lot, where the red awnings are. The building on the right is probably best known as the building where the Blue Room was.